Spraying Bare Aluminium on a Shopfront in Derbyshire. 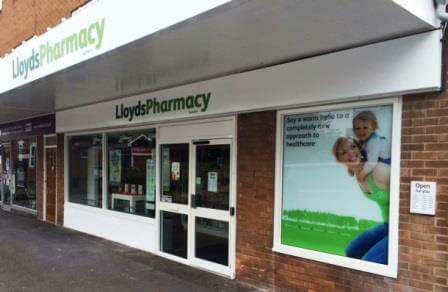 Lloyds Pharmacy called on Vanda Coatings for spraying bare aluminium on a shopfront in Derbyshire. We re-sprayed the exterior and interior of their shopfront, six windows and an automatic door in Spondon. The aluminium window frames and all the metal door framework needed refurbishing on this retail outlet in a high street in order to prevent corrosion and to improve the appearance of the outlet. Our teams at Vanda Coatings are used to working alongside other trades, but in this case our sprayers were the only operatives on site. Any spraying is usually carried out while shops are shut, so that customers and staff are not disturbed. In this case, Lloyds Pharmacy wasn’t open for business when the work was carried out on a Sunday, but the shop was fully stocked, so everything had to be protected. The framework was bare aluminium and the client wanted it painted to protect the substrate as well as to add colour, so before spraying on the top coat the surfaces were prepared to ensure a long lasting finish. Initially, everything was rubbed down with wet and dry sandpaper by hand then degreased with a mild degreasing agent. Ceilings, floors and walls were masked inside the shop to prevent spots of paint from getting on them and polyurethane sheeting was placed over the shelves holding all the products, so they didn’t have to be moved. The masking can be seen in the photo. The next stage of this project involved applying etch primer to the bare aluminium. This keys the substrate, so that the top coat will adhere to it. Our team leader decided that 5 layers of the white coat were needed to adequately coat the framework and the final layer was left to dry while our Vanda team cleared up. Tidying up is all part of our service which pleased the site manager.